We are now told, due to Trump refusing to allow entry to all who wish to come into the US, and for Asylum seekers, they will have to stay in Mexico until they have had a hearing, the caravan of people are now threatening to rush the border. Does not matter how you paint this, if they have such an intent, this is an invasion. I will admit that I am all for treating people with civility, does not matter if they are here legally or not, but to dictate to a sovereign nation that they either allow you in, or you and 7,000 will rush the border, come in with no vetting, that is by definition an invasion, should be repelled by the military as such. For the people wishing to yell that this is not an invasion, I would tell them, look at the definition, does not matter how much you wish to twist things up, it is an invasion by the very definition of the word. Our military is set up to protect our borders, no matter how the left likes to paint this if they try to rush the border, they are committing an invasion, it then should be a matter for the military and be dealt with as you would any other invasion. I don’t like to see this when women and children are involved, but over 80% of these migrants aren’t women and children, they are young men, men who aren’t fleeing due to a danger to their life, they are coming for what they see as an opportunity to have a better life, that is not what one seeks asylum for. What you have now is the left is playing this as a group of many children, because Obama set up DACA, that somehow we are obligated to do this again, I say pack them up at the airport, send them back to their parents, that is where they belong. Or that the crowds are majority females, should feel bad for them, of course, this has gone on every time we have of this, the last time at the beginning of this year we heard the same thing, yet once more over 80% young males. While there is a part of me that is sympathetic to these people plights, the simple fact is South America has 400 million, central America has another 180 million, there is no way we could take in even a small portion of all these people because of their economic plight, not to mention the billions around the world that would love to come here. 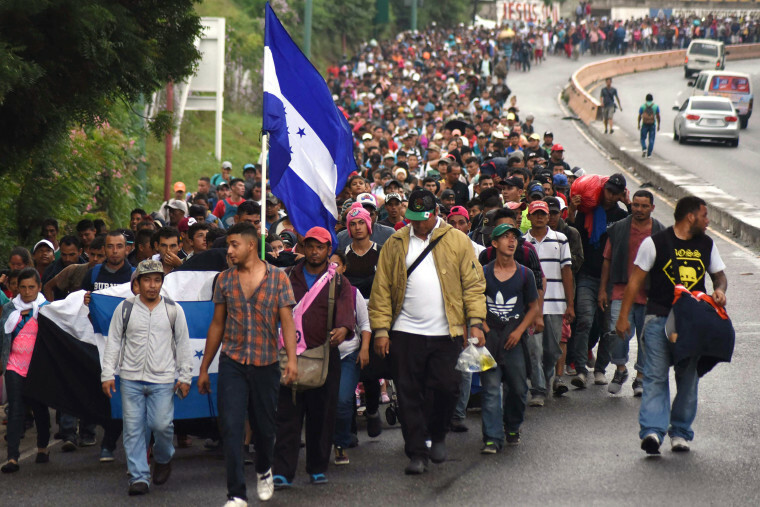 It is time to start treating this as it is, it is an invasion, should be treated as such, use our military to close up the border, while they aren’t allowed to act in a legal capacity in the US, they can secure our borders, that is what they were chartered to do, protect our shores from invasion, and like it or not, that is what this is starting to look like. As I have said before, I am 100% for legal immigration, am married to one, but I have a problem when people come here, feel it is our obligation to let them in, now are threatening to rush the border if we don’t, I must ask, “Why would we allow such an entitled feeling people to come in here in the first place, we have enough of these people already running around our nation, thinking they are entitled when they aren’t. Coming here is a privilege if you can’t understand that, then maybe we should look at if it is good for this nation to invite them to be part of us. Linda Sarsour – A blaring Example of the Left’s hypocrisy.